ROAD TOWN, Tortola, VI- A number of callers to the local television show “Speak Your Mind” used the opportunity to air their concern about road works being executed during busy traffic hours especially in Road Town and also offered some suggestions on how the problem could be alleviated. The show was aired on Saturday November 9, 2012 and hosted by Mr Julio S. Henry, along with co-host Mr Richard C. De Castro. The first caller who raised the issue said the Public Works Department created a major inconvenience to motorists by choosing to execute road works in Road Town during busy traffic hours. The caller also suggested that Public Works have certain road works in Road Town done during weekends when the traffic is less heavy. A few other calls expressed the same sentiments. 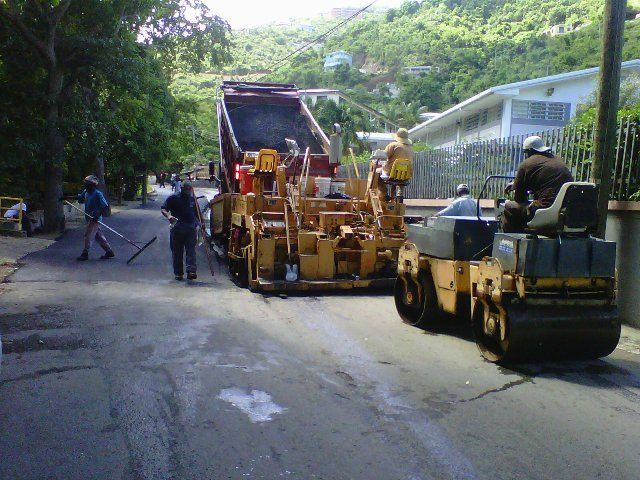 A caller who claimed he works in the Public Works Department said he understood the caller’s concern but Government was not willing to pay overtime to have such works done on the weekends. “The people over me are not paying any over time money and they expecting people to work on the weekend. They ain’t paying no money to work on the weekend so I have to do my job during the week,” the caller explained. The same caller also said that whenever works are being executed, and especially if it would be of inconvenience to motorists and other users of the road, that notices be put on the air or in the media to inform the people but the Department does not do that, he claimed. Mr Henry then asked the caller who makes the decision to execute works in busy traffic areas at a certain time to which the caller said he was not in a position to disclose that information. Mr Henry also suggested the need for flaggers to control traffic when work is being done on busy roads. Meanwhile, Mr De Castro suggested that the Department stagger the work hours so that certain road works could be executed before or even after busy traffic hours. Please!!!! when Mr. dcsatro waz at pwd tis waz dey same ting so he need to hush! The bigger picture here is the quality of work. Watching PWD work on the roads this is like watching grass grow, only slower. Seriously poor, shoddy work and our vehicles and residents suffer daily….even some of the private sector contractors is the same thing! But then again what yu all expect when yu all vote NDP anyway. ...me agree and at the end of all this Road Town continues to be flooded after any short shower. Your words are so powerful and true and it's very serious for real. Again? Does PWD ever get anything right? I agree with teh caller for It does not make senses to me. This is rediculous. The powers that be are people who have been outside of the BVi and seen how work on big busy highways are carried out. There is no need to take anyone's weekend. Let the workers stay home during the day and do their 40 hours per week during the night. Instead of starting work at 7:00 a.m, they start work at 7:00 p.m. and do their 8-hour work day. In that way the traffic is not obstructed during the day, and work can go on without inconveniencing too many people during the night. It doesn't take a rocket scientist to figure that out. "Where there is no vision the people perish" (Proverbs 29:18). Road Town, the BVI's capital and only city, is small and congested with a small road network and few collector or arterial roads. Further, it is the hub for commercial, government services, banking, medical services, education, financial, business and entertainment. During normal business hours on weekdays, it is bustling with a beehive of activity. And parking is scarce and traffic is challenging. The small road network means that there are few alternate routes for motorists during street closures. Street closures during normal business hours exacerbate an already challenging traffic condition. Consequently, to the maximum extent practical, any planned road repair, maintenance or construction work should be planned and scheduled for times that are the least inconveniencing to motorists, ie, weekends, holidays or nights. Doing some work at night will be more expensive but is the least inconveniencing to motorists. Further, any planned road closures should include press releases, public service announcements and should employ traffic safety plans. Moreover, emergency road closures should also be accompanied by press releases and traffic control. The BVI road network is gigantic… But one of the striking underlying facts is the condition of the roads. Since roads indirectly contribute to the economic growth of the country it is extremely essential that the roads are well laid out and strong a word to Mark Vanterpool! @Debate, I agree with you that our roads are poorly designed, constructed and maintained are in a deplorable condition. Most of our roads are in failed condition with a low pavement condition index (PCI).. The general philosophical approach is to ignore failed streets and focus resources to keep the remain streets from getting into a failed condition. Secondly, I also agree a strong transportation system, including roads, is vital for growth and development. However, you need to expand on the BVI having a gigantic road network. A public apology is the least what Mark Vanterpool can do on this matter. How is it when Lime and Water & Sewerage dig up the road after 4:30 p.m nobody complaining, here some day last week lime o the corner going up the hill where you go in where cable & wireless have their houses, pulling cable and the man directing the traffic almost cause an accident, but nobody mention that. But dem on PWD, PWD only could do so much because dem man dem there to damn LAZY. If dem would go straight to the jobsite when the leave the yard they will finish working before traffic get heavy. But when you put monkey to lead jackasses you got chaos. dem man working on the road have no leadership since Musa gone and the two foolish wisemen did not learn a thing from him, I remember Musa cussin the road man em one time he pass and them sitting down when them should be working, but dem two who in charge, all them want to do is drive around and pick up woman, food and groceries especially the killer. The man dem working on the roads is like the pack ah hyenas in the movie lion king dem mind so low that dem cant see no further than getting in the truck dem and drive around, as a fact that is the whole a PWD drive around town.